Antony and I continue to work on our Transgression project. I’ve now produced a set of twenty digital / autographic ‘drawings’ – number twenty is reproduced above – focused by ideas to do with geological transgression, flooding, etc. This entry was posted in Projects on August 31, 2013 by Iain. 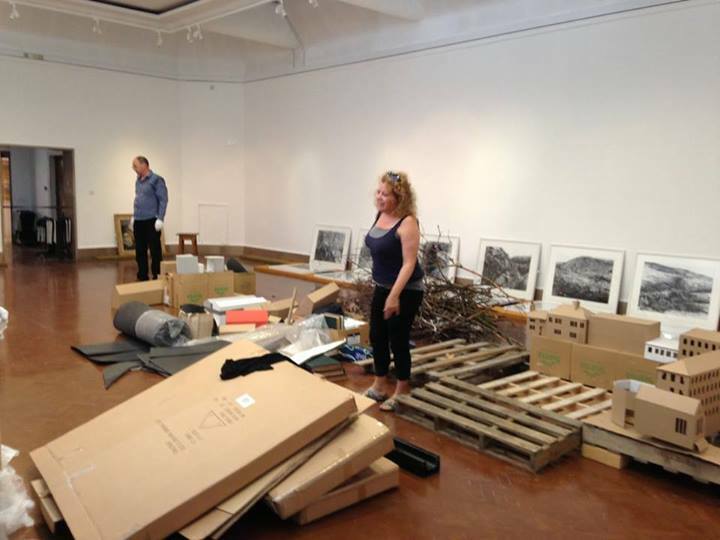 A photograph by Judy Tucker of Deb Gardner and myself working on the hang of our four person show. More on this soon. This entry was posted in News on August 29, 2013 by Iain. Mel Shearsmith and I have been working with the Parlour Show Rooms in Bristol on a four day event focusing on walking and talking, which will also involve the initial stages of what I hope will become a Bristol deep mapping project. We are very sure it will be more interesting the the annual influx of fibreglass animals that Bristol seems to go in for now (see above). Walking in the City is a unique four-day event exploring Bristol through artist led walks, talks, discussions and an evolving exhibition, curated by The Showroom Projects and PLaCE research centre. The four day event takes place over 12-15th September and explores how walking and talking can change our experience of the city. Walking In The City is an international gathering of walking artists, enthusiasts and academics at The Parlour Showrooms, in Bristol. This micro walking festival offers an extraordinary programme of performance, talks and an evolving exhibition. Over the four days audiences are invited to create time/space for imaginative wanderings, meditative practice and serious play. Artists; Phil Smith, Simone Kenyon and Simon Whitehead invite you to join them on walks around the city to re-imagine the every day, explore ideas of the collective, and question what it means to playfully engage with and see the city anew. All events welcome visitors to Bristol, as well as those who think they know this city like the back of their hand. The event is centered in and around The Parlour Showrooms, which will act as the cafe hub for the duration of the four days whilst also providing the forum for artists Sarah Rhys and Sue Maude to begin a process of ‘deep-mapping’ Bristol. Through this process they will explore the ancient city boundaries, investigate the hidden city waterways, and invite visitors to contribute to an evolving exhibition on the walls of The Parlour Showrooms. 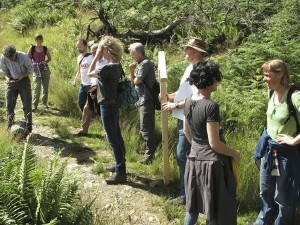 On the first day (Thur 12th) Phil Smith will open Walking in The City with ‘Crabbing in Bristol’; a derive, or ‘drift’. Described by the artist as an: ‘exploratory, destination-less wander through (usually) city streets, detecting and mapping ambiences, walkers’ subjective associations and those emotions and atmospheres ingrained in the urban structure and texture’. Each dérive is unique, and finds its own duration; ‘Crabbing in Bristol’ could last up to 7 hours. After having lived in Bristol for twenty years and now based in Devon Phil is, ‘looking forward to being a stranger here once more’. 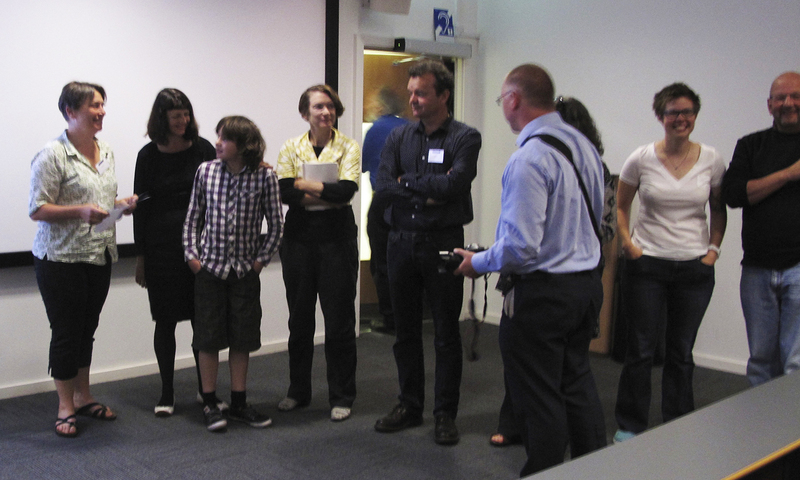 The second day (Friday 13th) is devoted entirely to a day long symposium; a sharing of research and discussion in and around walking artistic practices. Entitled: ‘Mapping Borders’ curated and chaired by UOB researcher Cara Davies, the symposium brings together artists and academics from all over the country to discuss practice and research. During the day there will be five panels of speakers including acclaimed academics and artists such as; Stephen Hodge (Wrights and Sites), Misha Myers and Dee Heddon (Stories from the Walking Library). The third day (Saturday 14th) welcomes internationally renowned artists Simone Kenyon and Simon Whitehead. In the morning Simone leads a walk together in silence to the cities borderlands, whilst in the afternoon she runs a workshop to practically explore embodiment and walking. Simon Whitehead leads a group in search of a place, where together they can howl into the night. The fourth and final day (Sunday 15th), offers a welcoming and reflective space for brunch and a talk, led by two walking artists/researchers; Jess Allen and Mads Floor Andersen. Here they return to the central question of ‘how can acts of walking and talking affect our experience of the city?’ Following on from this Tim Higgins, Canon at St Stephens church in Bristol, will lead the final walk of the four days, to find the hidden medieval walls of Bristol; hinting that perhaps the ‘stories of the Old City are not locked in time but can be set free to refresh our times’. Walking In The City is the third event of the In The City Series, a performance programme held in two empty shops on College Green in the centre of Bristol, curated by The Showroom Projects. The vision behind In The City Series is to hold an open space in the centre of Bristol to consider the questions: what does our city centre mean to us? What is the future of our high street? How do the borders of our city relate to the centre? The series aims to engage new audiences as well as provide access to artistic excellence. ‘WALKING IN THE CITY is part of PLaCE’s larger ongoing project to build links with organisations like The Showroom Projects and between people engaged with the ecologies of place, the arts, and relevant academic work. PLaCE – as part of the recently reconfigured PLaCE International (UK) – is pleased to be co-curating Walking in the City as part of its continuing commitment to facilitating interaction between the performing and visual arts, to engage new audiences and to explore place through diverse walking practices in the South West and beyond’. My experience is that telling stories can enchant me and open my imagination. But stepping out and walking inside the space, that is the deep gift of the city; story has the power to change my world view. How I view the world nurtures the seeds of my energy for change. I think what is amazing is we can really get inside that transforming space. This entry was posted in News on August 28, 2013 by Iain. In the essay that gives me the second half of my title, Audre Lorde asks: “what does it mean when the tools of a racist patriarchy are used to examine the fruits of that same patriarchy”? Later she also states: “survival is not an academic skill”. I need to return to these and other of Lorde’s observations because they help me ponder concerns that press in on me at present, following a wonderful period of new experience and exchange in Dundee. And of course the crux of the matter that troubles me is captured in this observation: “… the master’s tools will never dismantle the master’s house. They may allow us temporarily to beat him at his own game, but they will never enable us to bring about genuine change”. As so often when I get back from a powerful event shared with old friends and with exciting new contacts, I find myself pondering my own multiple connections and my ‘work’ (not primarily in the economic sense, but that other business of engaging with the mesh of connectivities we call ‘the world’). This questioning also relates to the Transgression film I’m doing with Antony Lyons, admittedly mostly through field trips, conversations and emails to date. This questioning has now been amplified further by reading the draft of an essay by the New Zealand/Irish artist Cathy Fitzgerald (in which she quotes some of my thoughts about ‘raw beauty’ published on this site). 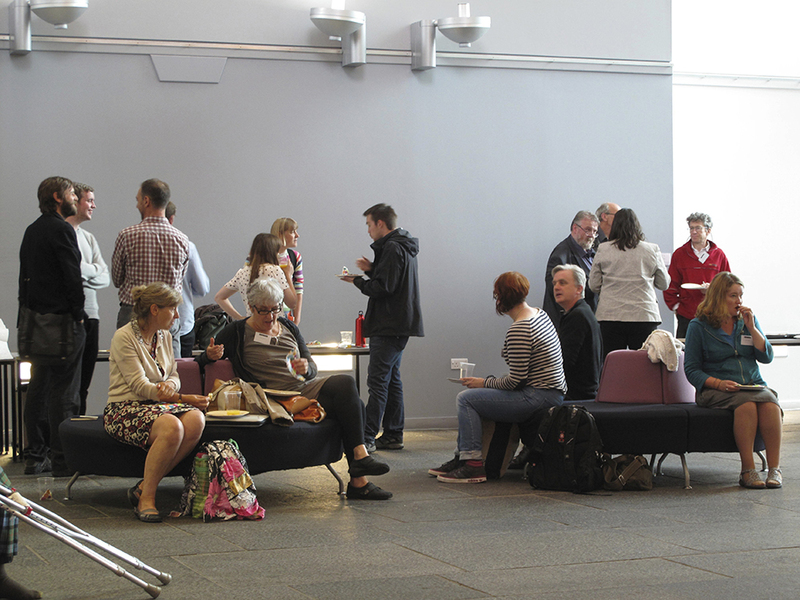 Cathy and I have just met up with each other again at Invisible Scotland in Dundee, a truly wonderful event – half academic conference, half locally led ‘walk-about’ – put together by the incomparable Mary Modeen. Cathy’s essay, which I found generated more serious food for thought, will appear later on her blog: beyond ecocide toward deep sustainability: stories from a small Irish forest. 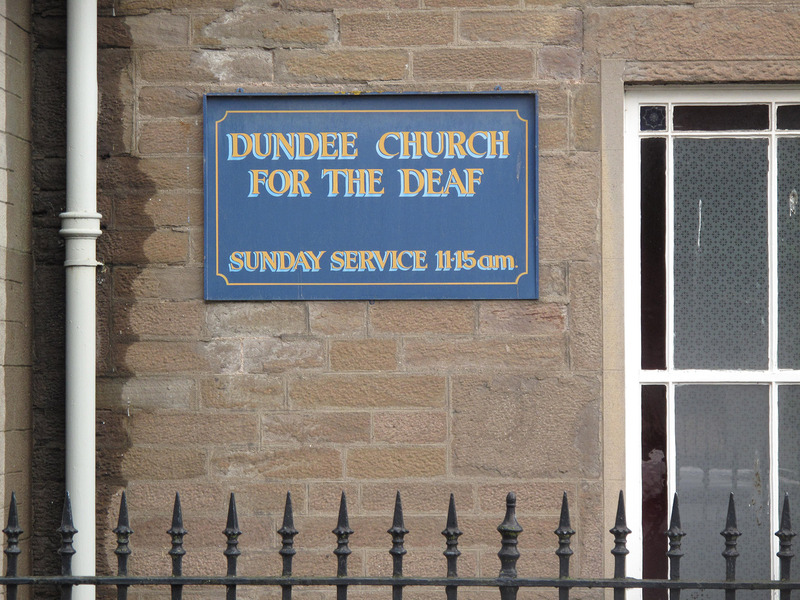 Two things impressed themselves on me in Dundee which relate to all this. The first is that there is now a whole emergent ‘younger’ generation of people in dialogue with the PLaCE International / Mapping Spectral Traces network nexus. This includes graduate and doctoral students, ‘young’ and ‘established’ artists, and interdisciplinary folk of various persuasions more than able and willing to contribute to the development of the networks’ concerns. But, as the Dakota activist Mona Smith reminded us during the co-ordinators’ meeting afterwards, there is less dialogue with, and inclusion of, the ‘local’ people with the greatest knowledge of the places with which we are concerned than there should be. I will return to this later. The second thing that impressed me is that there is now much more open disagreement – ‘dissensus’ if you like – between members of the core group than there used to be. This seems to me a very positive situation for a number of reasons. When we first got together as a group, it was very much for mutual support in what was then – for academics with our concerns and orientations – a disinterested and often openly hostile environment. That has changed, at least in some of the places we work in, as issues of interdisciplinarity and ecology have become more visible. (The old problems have, however, often simply taken new forms – not least in imposing impossibly heavy workloads on people already doing more than their fair share of work for the institution). What has changed fundamentally is our ability to articulate our collective confidence in what we do and, alongside that, our greater willingness to debate our differences rather than stress our commonalities. One of those differences is, I think, very much to do with how we each understand ‘community’, an understanding that is inevitably closely bound up with our particular contexts – physical and otherwise – our aspirations and inheritances. Community as part of lived experience is, for example for Mona and myself, inevitably something very different. My personal concern is how, as disparate people with shared concerns, we now negotiate our differences in this respect. This is, at least for me, an intensely practical question to do with how time and energy are used. Which brings me to the issue of transgression. Antony and I originally thought of this in geological terms – environmental events during which the sea rises in relation to the land so that the shoreline shifts upwards, covering more ground and resulting in flooding. This issue of land lost to the sea is clearly one of the major impacts on human habitation resulting from climate change. However, because of discussions and a particular shared experience of ‘silver bullet’ thinking being used to dismiss Antony’s suggestion that we need to focus more on preparing to undertake major adaptions to every aspect of our way of life and less on ways to preserve the status quo, ‘transgression’ has now become the centre of a whole mesh of linked understandings and concerns. An unnerving part of all this is the privilege that derives from our investment in professionalism – artistic or otherwise – and in academic knowledge. What indeed does it mean today when the tools of a global economy run by a racist patriarchy – not least among which are the professional worlds of culture and the university – are still used to examine the fruits of that same patriarchy? And if it remains the case, as I think we know in our hearts, that “the master’s tools will never dismantle the master’s house” and, indeed, more and more rarely “allow us temporarily to beat him at his own game”, then what are we going to do? If those tools – of disciplinary academic knowledge and state-sanctioned and funded ‘transgressive’ art, for example – “will never enable us to bring about genuine change”, surely we need to think carefully about how we use these tools and whether it is perhaps time to forge some new ones of our own? While I accept that we may need to use our privileged access to the master’s forge and workshop to do so, we need to be very clear that we really cannot have our cake and eat it. 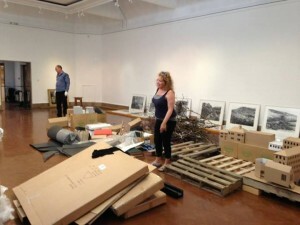 As I have now argued both in recent texts and at public events on a couple of occasions recently, it seems to me that we (those of us who have the privilege of working as artists and academics) have to give something up in order to contribute to trying to dismantle the master’s house, to make the space necessary for real change to come about. This ‘something’ is, I think, the engrained attitude of ‘possessive individualism’ that dominates and determines the reality of the art world and the academy. Until we address this the matters that are central to Guattari’s third ecology – that of those constellations we call the ‘self’ – will remain an intractable problem that undermines our efforts at the social and environmental levels. And this returns me to something Joseph Beuys said to me shortly before I graduated as an art student. “Always remember, education is more important than art”. But not, perhaps,education as managed by the university as it now manifests itself? This entry was posted in 'Translation' on August 9, 2013 by Iain. After two very full days at this powerful event my group has a later start this morning, giving me time to catch up with my thoughts. The group I’m walking with, yesterday and then again today, has a fluctuating membership that ranges across a wide range of interests and backgrounds – Jill Aitken is a forest manager working about an hour’s drive north of Dundee with the Woodland Trust, while Professor Elaine Rutherford, a former student at Dundee, now teaches art in Minnesota. Our guides, morning and afternoon, give us a very good insight into different aspects of what, on the first day, was referred to an the multiplicity of Scotlands that co-exist here. I’ve much enjoyed talking to them all, and to friends like Dr Rowan O’Neill, who recently finished a PhD on Cliff McLucas at Aberystwyth. In the image below Jill’s husband John, a builder, holds the more elegant of the two markers we carried with us on Friday. 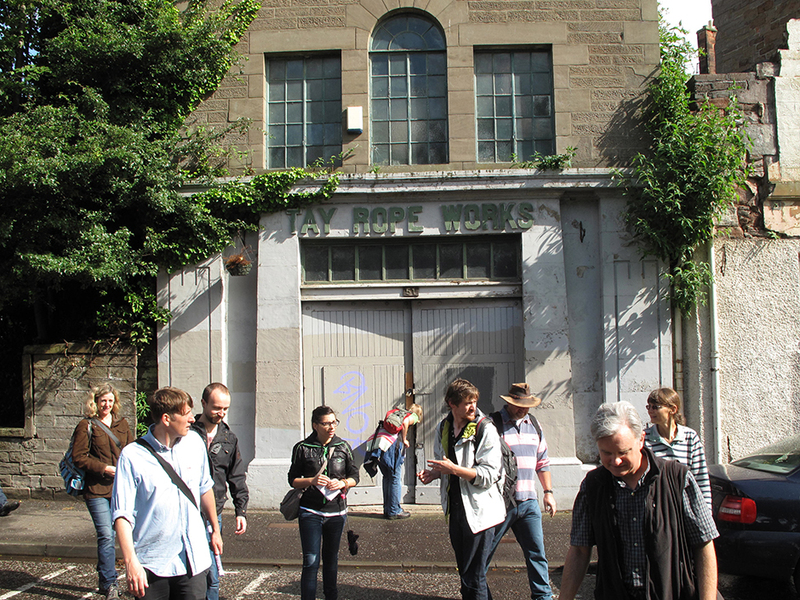 The group is standing outside the original entrance to an old rope factory (we found another, unofficial entrance into this extraordinary space, hidden away among the conplex of housing and gardens between the university site and the firth. 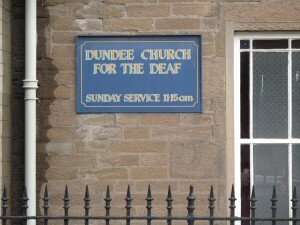 The presentations on the 1st August were equally diverse – from Previn Ahmad speaking briefly about the the work DIWC does with women who, for a variety of reasons, are ‘invisible’ within the wider civic community of Dundee through to a quite extraordinarily beautiful presentation on ‘The Sound of Highland Landscape’ by Margaret MacDonald – a singer, teacher and folklorist – with whom I could happily have talked all day. 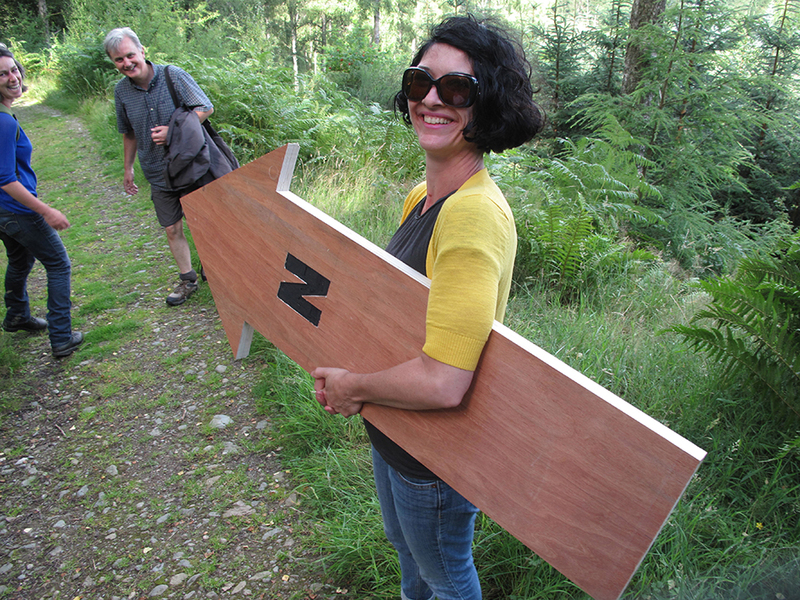 The photograph above is Elaine Rutherford holding one of two wooden markers which the group took on their afternoon walk to Birnam Hill, where we walked and talked about the work of Patrick Geddes with Lornens Holm and Fergus Purdie. This entry was posted in News on August 3, 2013 by Iain.